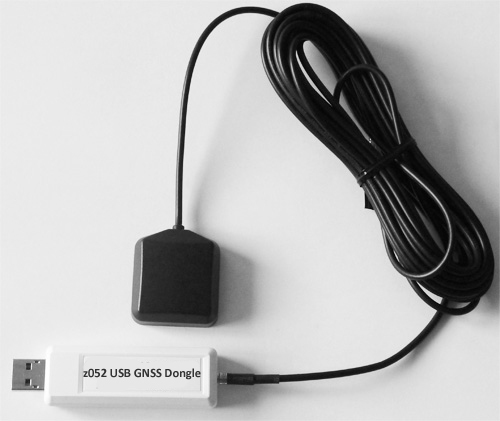 The z052 USB GNSS Dongle with PPS is used for timing and navigation applications. The Pulse Per Second (PPS) is an electrical signal that very precisely indicates the start of a second. The z052 GNSS chipset delivers the PPS signal with the accuracy ± 20 nanoseconds (at chipset level). 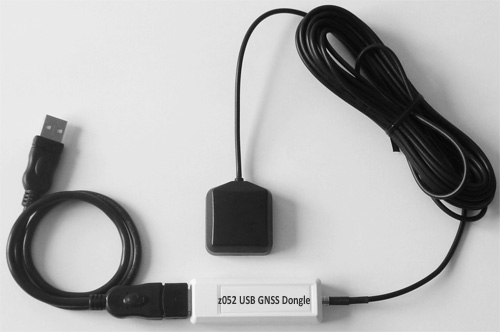 The z052 USB dongle provides a GNSS receiver from an USB port and a PPS timing output. The z052 unit is based on a GNSS receiver from u-blox with 72-channel whose 32-channel continuous tracking and high sensitivity (tracking -167dBm GPS & Glonass). Note #1: the augmentation systems SBAS and QZSS can be enabled only if GPS operation is configured. Note #2: The z052 USB dongle is configured by default with GPS, Galileo and Glonass. With its higher sensitivity, performance and faster startup times, the z052 module is a complete GNSS receiver that generates position fixes with high accuracy in extremely challenging environments and under poor signal conditions (down to -167 dBm), velocity and time data with leading edge acquisition times. In addition, the GNSS receiver provides a configurable 1 PPS synchronized to GPS/UTC, typically within 20 nanoseconds (one sigma) at chipset level and an update rate up to 4 Hz. The z052 dongle optionally supports Satellite-Based Augmentation System (SBAS), including the U.S. Wide Area Augmentation System (WAAS), the European Geostationary Overlay Service (EGNOS), MSAS in Japan and GAGAN in India. Assisted GNSS (A-GNSS) is also supported. When the z052 USB dongle is connected to your equipment (desktop, laptop, netbook, UMPC …), a virtual serial port is available after installation of the driver by the operating system – for example: USB Serial Port (Com x). For most of the operating systems two types of driver are available: Virtual COM Port (VCP) drivers and direct (D2XX) drivers. The VCP driver emulates a standard PC serial port such that the USB device may be communicated with as a standard RS232 device. Virtual COM port (VCP) drivers cause the USB device to appear as an additional COM port available to the PC. Application software can access the USB device in the same way as it would access a standard COM port. The D2XX driver allows direct access to the USB device via a DLL interface. Application software can access the USB device through a series of DLL function calls. The USB dongle contains a USB to serial UART interface and the PPS signal provided by the GNSS chipset is connected internally to pin 8 (CTS). So, the PPS signal delivered by the USB dongle is available by using the CTS signal on the virtual com port used. GNSS performance statistics are clear view, stationary. Sensitivity based on signals measured at the antenna. Contains: z052 USB GNSS Dongle with PPS + USB Extension Cable + GNSS patch antenna (5m cable) + CD-ROM (Software & Documentation). Contains: z052 USB GNSS Dongle with PPS + USB Extension Cable + GNSS patch antenna (5m cable) + CD-ROM (Software & Documentation) with one license of Windows TSS-P for z052 software (Time Service Software) for the update of the PC clock with 1ms guaranteed accuracy. Copyright © 2019 ZTI Communications. All rights reserved.